Gallery Muku has 3 spaces available for use. Please choose the space that is most suitable for your exhibition or event. This is the largest space located in the front of the building facing the road. The spacious white walls are perfect for both large and small works of art, with elegant lighting fixtures designed by Ingo Maurer suspended from the ceiling. This space offers a perfect blend of traditional and contemporary sensibility. This space features the beautiful atrium-style vaulted ceiling and beams that are a characteristic point of this building. With the impressive contrast of white mortar walls and dark support beams and lighting fixtures designed by Ingo Maurer, it is a delightful space for exhibitions and other creative projects. 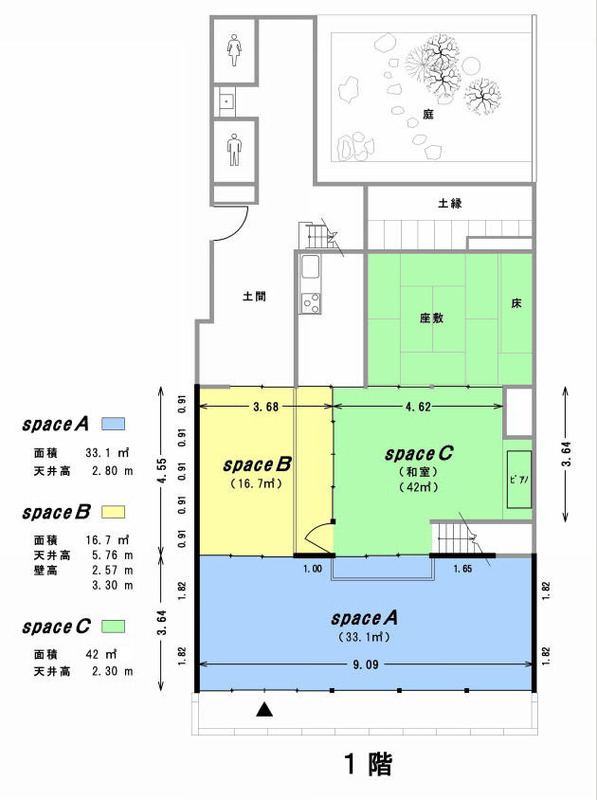 This space is the heart of the first floor of the building – two large connecting tatami rooms restored to their original condition when it was the living space of the original owners. A beautiful tokonoma is the centerpiece of this space, flanked with beautiful shoji and glass and wood doors on three sides. In addition to being a comfortable room to hold meetings and other events, it is furnished with an upright piano, making it is an ideal space to hold concerts.